Francis Joyon's Idec Sports in Pointe-à-Pitre. 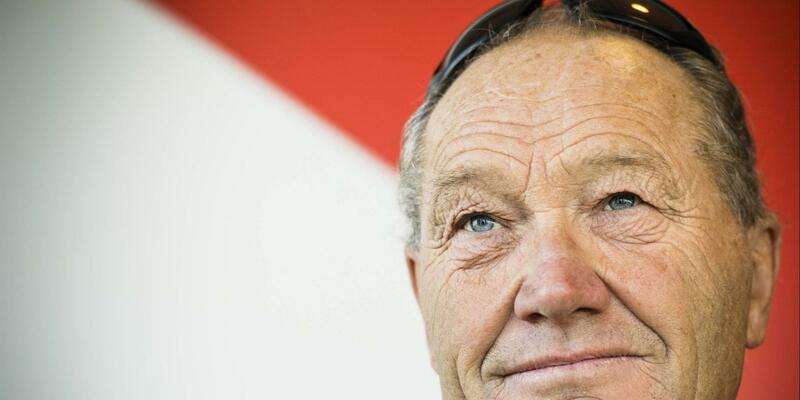 At 62, Francis Joyon won the 11th edition of the Route du Rhum at the helm of IDEC-Sport, a maxi-trimaran that has now won the queen of transats three times since 2010 with Franck Cammas and 2014 with Loïck Peyron. Four years ago, it took Peyron 7 days, 15 hours and 8'32''. 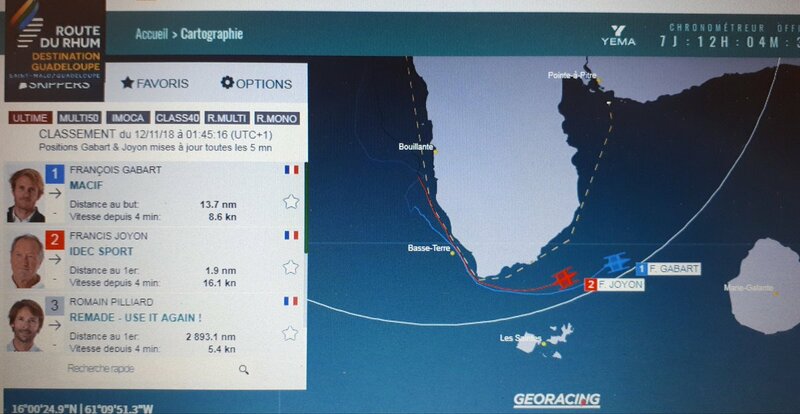 Reference time planed by Joyon (7 d. 14h28'55'') but also by François Gabart (Macif), who arrived 7'8'' after him. 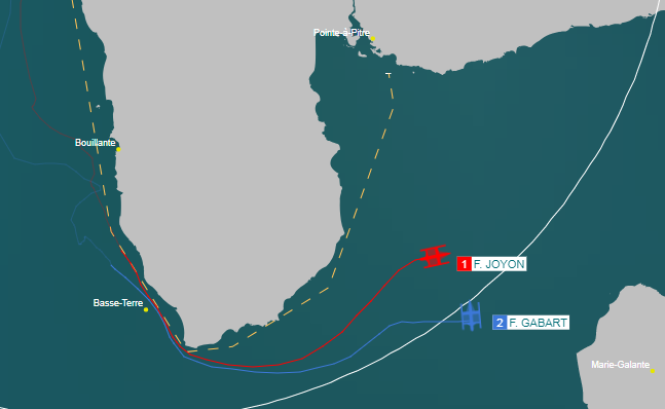 Francis Joyon and François Gabart had an epic duel in the final hours of the transatlantic race, sailing at each other's sight, before Joyon won the race. With a new record at stake. 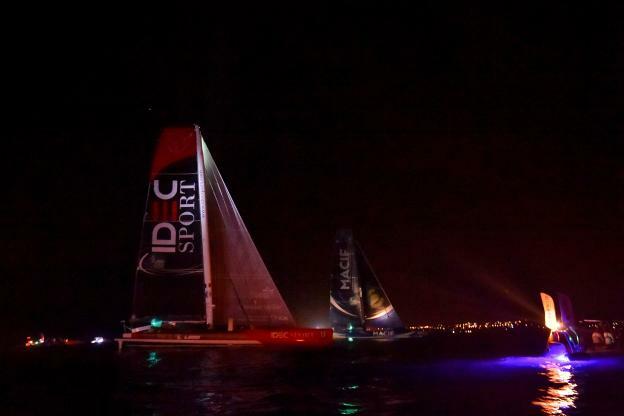 It was in an exceptional nightly finale, full of suspense, that the 11th edition of the Route du rhum ended with the victory of Francis Joyon, just a few hundred metres ahead of François Gabart. The decision was made in the very last hours, the last few minutes. But when the appearance of the little Olympus-Photo behind Kriter V took place in a good swell forty years ago, all sails filled, the victory of this edition was decided at night, in a very light wind where tactics and manoeuvring intelligence took on their full meaning. With less than a mile to go (less than two kilometres), the two boats were about two hundred metres apart, putting the two skippers almost within earshot before Joyon made the decisive tack and won the race at 4:22 am in mainland France. 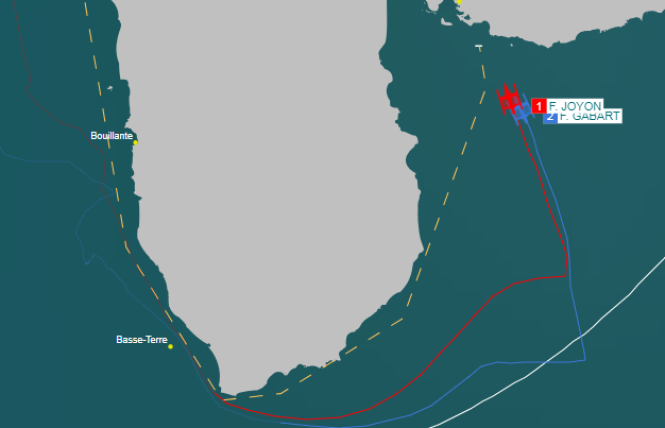 For most of the 2018 race, which started on 4 November from Saint-Malo, François Gabart had nevertheless led the race on Macif, his Ultimate class sailboat, with Francis Joyon in his wake, despite having relegated him to 165 miles in the heart of the Atlantic. But in the last few hours, as we approached the West Indies, Francis Joyon made an exceptional comeback. 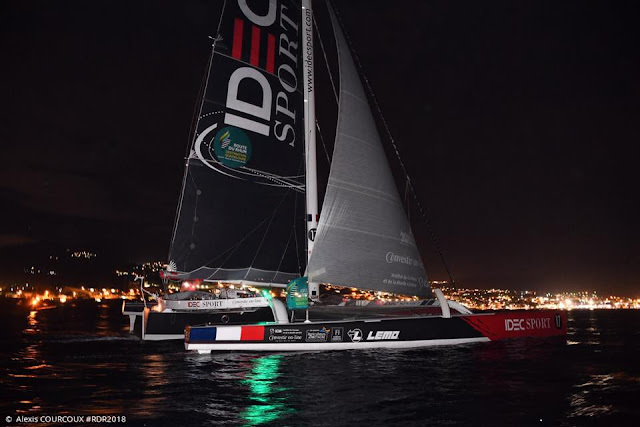 On Sunday, while the Idec Sport skipper was less than 15 miles away, we learned that François Gabart had lost a foil and then a rudder during his crossing, which explains his increasing difficulties in maintaining the gap with his pursuer. 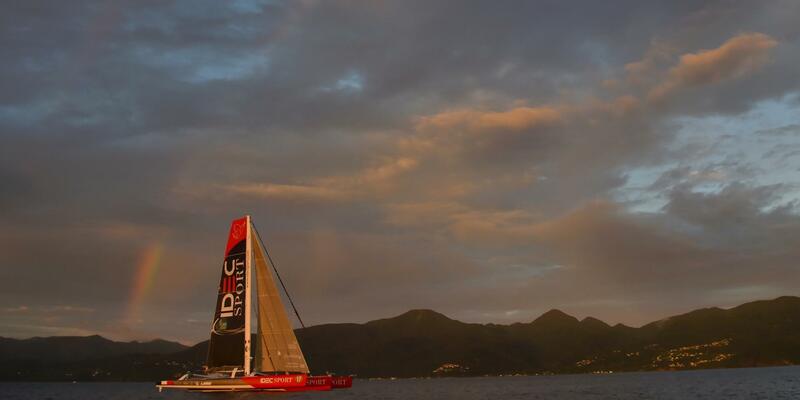 The two competing skippers then had to go around Guadeloupe from the west and then return north to reach the finish line opposite Pointe-à-Pitre. It was in this windless western zone that Joyon first managed to get back within one nautical mile (1.8 km). 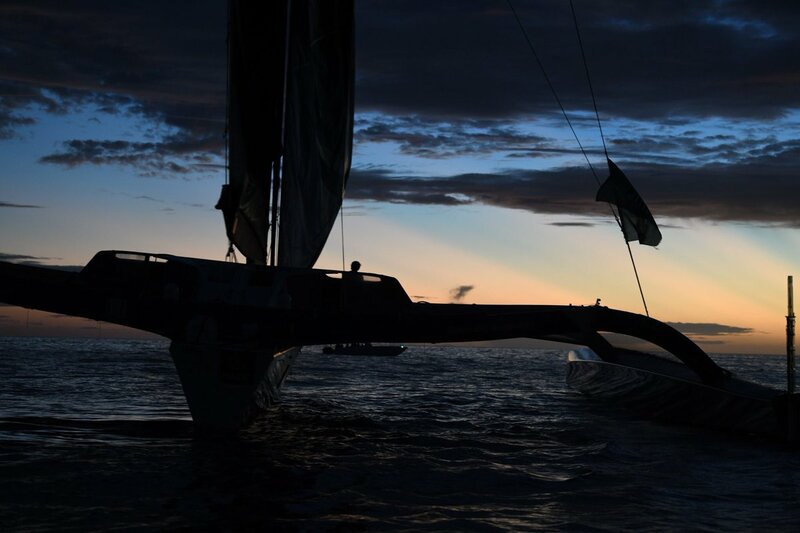 At dusk, the two sailboats could see each other in the distance, while the transatlantic was transformed into a coastal regatta. At the last buoy, on this chickly coast in a breeze, Macif crossed the mark 17 minutes ahead of Idec Sport. 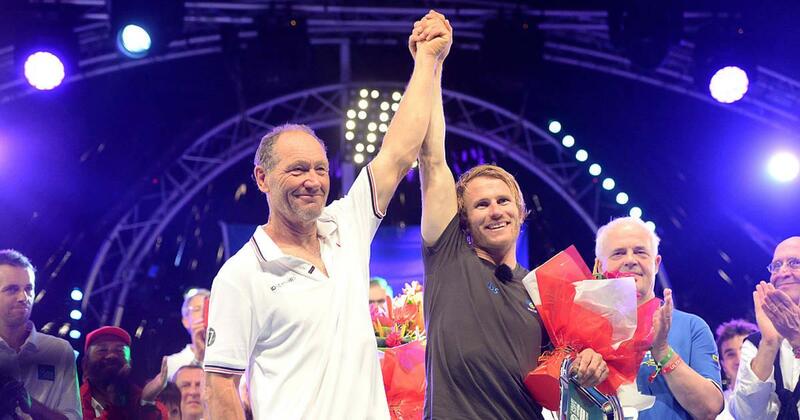 Shortly afterwards, however, François Gabart managed to regain some steady wind, while Francis Joyon found himself dragging a locker line on his starboard rudder. Incroyable finish !! Les deux bateaux sont bord à bord à moins de 1 mille de l'arrivée ! NOAA : How can we assist you?